Many users said that the upper material was lightweight and extremely breathable. The shoe provided a secure fit and a great overall foot support, according to some runners. A majority of buyers commented that the shoe was comfortable. Several users were satisfied that the color options available were pleasing to the eyes. The lightweight nature and the agreeable heel cushioning received positive feedback. Several reviewers thought the midsole was lacking in arch support. There was not enough traction on wet trails, as observed by some runners. Several buyers agreed that the toe box is narrow and uncomfortable. Made from a lightweight and breathable material, the Charged Bandit 3 is a comfortable running shoe that is recommended for both beginners and seasoned runners. It aims to deliver a consistent performance no matter the distance. While some may not be satisfied by the traction and support it offers, most users will find this a reliable option. The unassuming, affordable and lightweight Under Armour Charged Bandit 3 is a shoe a lot of runners would not give a second look. First, Under Armour is known more for its training shoes than running ones. Second, it's relatively cheap. We have that perception that the cheaper it is, the lesser the overall quality of the shoe. This is where these pair of shoes destroy all the myth. Personal adversity led me to buy a pair of Charged Bandit 3 (bought it for CAD 54 - an absolute bargain), and I have been impressed with the superior quality of the shoes with each passing run. 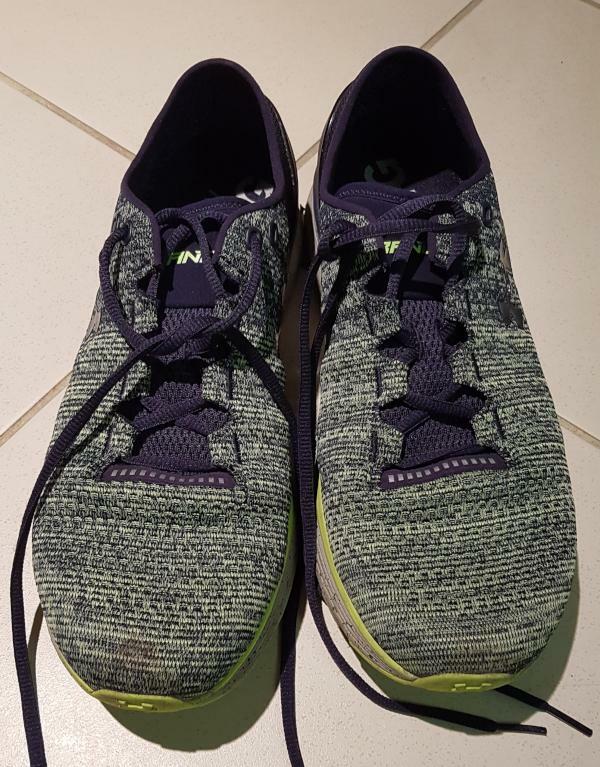 As a midsole or even sometimes foot runner, the shoes provided great support in my 50+km run that I have accumulated on the shoes. These shoes are lightweight and durable making it an ideal pair for runners looking for performance, speed, and comfort. The Charged Bandit 3 is made with a seamless, breathable design making it an extremely comfortable shoe to wear. The back of the shoe is protected by a TPU heel counter which gives it superior support ensuring that back of the foot does not slide out easily. These shoes are an anomaly in comparison to the competition as it has minimal cushioning for the Achilles tendon which made me paranoid about this purchase. I have always been used to a good level of cushioning, and I was pleasantly surprised by how unaffected I have been without the cushioning during my runs. The EVA tongue is supposed to stay put; however, I can see this being a potential problem for most runners. It has a very weird construction, so it tends to sit on your foot at an odd angle making it uncomfortable at times. Most of the runners would need some time getting used to this design. The midsole of the Charged Bandit 3 is where this shoe is so impressive. Powered by Charged Cushioning® technology, made from 2-piece compression-molded foam. This is where enhanced firmness is provided at the heel yet soft at the forefoot making it a delight for neutral, midsole and forefoot runners. This technology makes every run of mine super responsive with enough energy return ensuring that I have a smooth yet consistent run. Under Armour also an antimicrobial Ortholite® sock liner, delivering a snug fit to my feet (I feel they conform to my feet). I am not able to provide any efficacy to the claims of this sock liner’s antimicrobial property. I am an outdoor runner, and I love to run on different surfaces like road, pavement, trails and concrete surfaces. I very rarely run on the treadmill and hence I am not a big fan of shoes which don’t have a good outsole. The Charged Bandit 3 has a relatively good and sturdy outsole and I have had extremely good traction on the different surfaces I have run on. The shoes have performed significantly well through the different surfaces I have challenged them to. The outsole has grooves across the forefoot which gives me flexibility and a smooth run as I am landing on my midsole or forefoot. Some of the downsides I have observed is when I have run with this on slightly wetter conditions. The shoes tend to drift on wet trails slightly, and I have relied on slowing down to ensure I still have enough traction to continue. I used to own an Adidas Supernova which had the Continental® outsole which reigned supreme in any condition, and hence I am extremely critical of the outsole make. The other major highlight of the shoes is its availability of exciting color options. I make extremely bold choices with my running shoes, and I am happy that I could get the green-blue hue. I have been running for a few years now, and I always invest in Adidas or maybe a Nike. However, the purchase of the Charged Bandit 3 has been one of the best, and my entire perception of Under Armour has been blown to smithereens. I can see myself running a few hundred kilometers easily with this, and I might even use this for a 10k or half marathon in the near future. The snug fit and the midsole cushioning make it one of the best shoes that a runner of any profile (from a beginner to an expert) can invest in. Although it has been discontinued for the Charged Bandit 4, you could find these shoes at some stores being sold on a discount. If you haven’t, invest it the Charged Bandit 3 right away! Under Armour Charged Bandit 3 are awesome running shoes, but they aren’t exactly perfect. Still, great shoes for the average runner. The Charged Bandit 3 is designed to be lighter and more durable than its predecessor. It does retain some of the tried-and-tested features of the shoe line, such as the solid rubber outsole, the flex grooves, and the Ortholite® sock liner. The shoe was crafted daily use, either on long runs or short sessions on the treadmill. Featuring the UA Charged Cushioning® technology, the midsole is made even more responsive and durable as it provides optimal cushioning and energy return. This design is suitable for neutral pronators. The upper makes use of a lightweight mesh that hugs the foot for a flexible coverage. Under Armour’s own SpeedForm® technology allows the shoe to mold to the foot for a precision fit, therefore eliminating distractions. The shoe is true to size and will wear best on runners with an average-volume foot. The width profiles are D – Medium and 4E – Extra Wide for men, and B – Medium for women. The rubber outsole of the Charged Bandit 3 has a full ground contact design, thereby providing traction that is suitable for runs on dry concrete and on treadmills. The heel area employs a high-abrasion carbon rubber to handle high-impact zones and to deliver a heightened performance. It also aims to provide additional traction. There are strategically-placed flex grooves to add flexibility in all the appropriate areas and allow for a smoother ride. The flex grooves also enable support for the foot during longer runs. The midsole of the Charged Bandit 3 consists of the Charged Cushioning®, which is made from a two-piece compression-molded foam. This cushioning is softer at the forefoot and firmer in the heel, thus providing a blend of comfort, support, and impact protection for long-distance efforts or up-tempo runs. Charged Cushioning, which is also used in the Bandit 4, also aims to deliver a higher level of responsiveness and durability while having optimal cushioning and energy return. An antimicrobial Ortholite® sock liner is provided to mold to the foot and provide additional underfoot support while also preventing the buildup of bacteria. Designed to provide an elevated level of comfort, the upper of the Charged Bandit 3 is made with a seamless, breathable design using a lightweight circular knit material. While it is supposed to feel good to wear, it also delivers strength and support that stretches and moves with the foot while running. The foot is guaranteed comfort and an anatomical fit with the help of the SpeedForm® technology, which comes in the form of a seamless molded heel cup that aims to feel like an extension of the foot. This also allows the foot to perform better as the precise fit eliminates distractions from running. Protected by an external TPU heel counter, the shoe is given an enhanced structure and a locked-in support to keep the back of the foot in place. A snug yet stretchy toe box is present to provide a secure fit for the toes. The EVA tongue is uniquely constructed as it connects to the upper so that it stays put, thus providing comfort over the top of the foot.